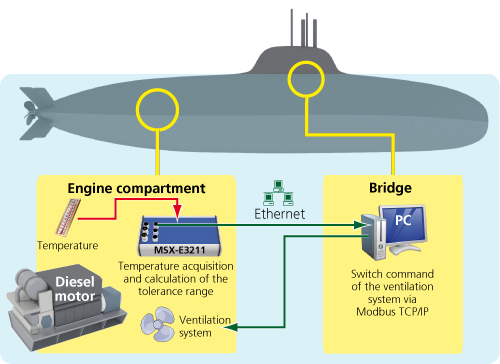 The motors and generators of a submarine shall be permanently monitored to avoid overheating. For this, a data logger shall effect temperature measurements and send a signal through Modbus TCP to a PC on the bridge as soon as a temperature limit is exceeded. For reasons of space, the temperature measurement system must be compact. Furthermore, it shall be resistant to the harsh environmental conditions and interferences on a military submarine. Thus it takes load off the PC on the bridge. For data recording, the system comes with a 64 MB RAM onboard memory. The robust and compact system is compliant to the degree of protection IP 65 and is suited for an operating temperature from -40° C to +85° C. Furthermore, it is resistant to vibrations, resonances and forces up to 20 G. Protective circuits ensure the interference resistance of the system. The MSX-E3211 is equipped with a Modbus TCP server for transferring the acquired data to the PC on the bridge.